The bold faced type below comes directly from this letter being sent to parents by Phoenix CSD Superintendent Judith Belfield. Feedback from parents in Oswego County, NY indicates that other similar letters are being sent throughout the region. The letter is coercive and misleading and has resulted in outrage and disappointment from parents. The letter is dishonest and suggests that parents allow their children to participate in a test and punish system that is designed to show kids, teachers, principals and schools as failures. Parents are aware that participation in grades 3-8 testing leaves room for the privatization of our public schools while showing complicity with a system that narrows the curriculum and sets developmentally inappropriate expectations for students. In an effort to inform the public of the facts about NYS grade 3-8 testing, Opt Out CNY has responded to letter in italicized type. Regardless of the specifics of the letter from Superintendent Belfield, our answer to her must ring clear: we remain steadfast in our intent to refuse grade 3-8 Common Core ELA and Math tests this spring as a way to show our support for public schools while also advocating for an end to the data driven, test centered learning environment that will lead to the privatization of our schools. Plain and simple: WE REFUSE. Please call your Board of Education members and plan to attend the next Board of Education meeting to share your opposition to the NYSED Regents reform agenda and the (Phoenix) Central School District’s misleading letter. We want everyone in our district to be informed of our instructional direction and intentions with the 3-8 NYS ELA and Math Assessments this spring. We continue to encourage all of our district staff, students, and parents to fully participate in the 3-8 NYS ELA and Math assessments. The results from state assessments are an integral part of instruction. The results on the NYS Assessments help us to determine whether or not the goals of our instructional program are being met. We use assessments to measure how much our students have learned and to see if our students are meeting standards. As a regular part of the academic program offered to children the District has a variety of measures used to determine whether or not the goals of instructional programs are being met and for monitoring a student’s progress towards meeting State Standards. Those include but are not limited to student work, formative and summative assessments, report cards grades, classroom participation, diagnostic assessment, and curriculum based measures. The regular and timely feedback provided from these measures, and the communication between parents and teachers, whom are known and trusted entities, are more than adequate measures to be confident that the district is meeting children’s unique educational needs. Moreover, the claim that the tests provide meaningful feedback is baseless considering tests are developmentally inappropriate. Only 50% of each exam is released to the public. Analyses of the portions of the exams that are released show that as little as 15% of the CCLS are assessed and reading passages and question stems are 1 or more grade levels above that being tested. (See here here and here). NYS tests also contain embedded field test questions (see School Administrator’s Manual, page 5). While field test questions are not counted toward nor against a student’s score, the questions often hamper a child’s ability to complete the entire exam and this would negatively impact a child’s score. Tests are also excessively long in length. In 2014 students in the 5th grade sat for a minimum of 540 minutes to complete both tests whereas in 2008 grade 5 students spent 160 minutes on testing (see here). Furthermore, results of the tests are not provided until months after the student has completed the exam and moved on to the next grade level. State provided scoring reports are vague and do not inform the student, parent, or teacher as to the specific areas and ways in which students can improve. The State provided report provides parents with nothing more than the number of questions answered correctly in reading and writing, the statewide averages for those figures, a scale score, a proficiency score, and a child’s statewide percentile score. A more detailed description of the scoring reports can be found at EngageNY here, and here. After considering the above, it is futile to argue that developmentally inappropriate and secretive tests should be used to make decisions about a child’s academic placement and a school’s academic program. Yet even if one were to ignore the facts about tests, the point remains: results from one test provide only a brief, incomplete snapshot of a student’s academic performance. Using data from grade 3-8 tests to make important decisions about children and schools is irresponsible, reckless and is in fact, one of the main reasons why parents refuse tests. Assessment results impact decisions about grades, placement in programs, instructional needs of individual students, the impact of our curriculum, and in many cases state and federal funding. It is against the law to use student test scores from grade 3-8 math and ELA exams as the sole factor in determining the appropriate academic placement for a student. According to S06356, passed March 31, 2014, “The commissioner shall provide that no school district shall make any student promotion or placement decisions based solely or primarily on student performance on the state test administered standardized English language arts and mathematics assessments for grades three through eight. Specific guidance has been provided to all school districts in New York State regarding this very issue. That NYSED document can be found here. A school district however, may consider student performance on such state assessments provided that the school district uses multiple measures in addition to such assessments and that such assessments so not constitute the major factor in such determination.” Simply put, if a student refuses to participate in NYS grade 3-8 exams, that student cannot be placed into AIS for lack of a score, nor can that student be denied AIS services. Similarly, students cannot be denied access to accelerated/advanced programs based on test refusal. The (_____) School District receives federal funding through our Title grants. We are expected to have a 95% participation rate in the 3-8 NYS ELA and math assessments. Our Title I federal funding could be affected if our participation rate drops below 95%. Approximately 98% of our Title I funds are dedicated to salaries of teachers and support personnel. The bottom line: Title I money is NOT taken away. In 2012, NYS received a waiver (known as the ESEA waiver) from some of the federal accountability mandates in NCLB in exchange for adopting Race to the Top and all of its mandates. In exchange, NYS was able to wipe the slate clean for all schools in NYS that were labeled as failing and implement a new, statewide accountability system. In 2012, NYS used specific criteria to identify 10% of schools districts as Focus Districts and the lowest performing 5% of schools as Priority Schools. The waiver indicated that other than the schools initially identified, NO new Focus Districts or Priority Schools could be identified before the end of the 2015-16 school year. The waiver also indicates that Focus schools may only be identified if they are already within a Focus District and that schools with low performing subgroups of students or groups of students failing to meet AYP could be labeled as Local Assistance Plan, or LAP schools, after three years of demonstrating weakness on the same indicator. NYS is currently in the process of renewing the ESEA waiver as it is set to expire at the end of the 2015-16 school year. While the rules that govern school accountability in New York State are dense and complicated, they are readily available on the NYS Department of Education’s website. Since The Phoenix Central School District is not currently a Focus District, NO schools within the district can be labeled as a Focus School. However, schools within the Phoenix Central School District can be labeled as Local Assistance Plan (LAP) schools should they fail to meet AYP (Annual Yearly Progress) for the SAME subgroup of students for the SAME accountability measure for three consecutive years. This means that if a school were to fail to meet AYP for three years in a row for failure to meet the 95% test participation rate, the school could labeled a LAP school. If this were to happen, the school would be required to develop a plan describing how they will improve test participation. At this point, while there is some paperwork involved, NO money has been lost or re-allocated or set-aside and Phoenix would maintain its “good standing” label. According to the current ESEA waiver, a LAP school may be a LAP school indefinitely without earning the label of Focus School. However, in NYS’s ESEA waiver renewal request, the state has proposed that beginning in the 2016-17 school year, LAP schools may be labeled Focus schools after three consecutive years of being labeled a LAP school. Essentially, if NYS’s ESEA waiver renewal is approved by the federal government, a school would not be labeled a Focus school for the next 6 years. So at the moment, no school district that is considered to be in “good standing” will be put at risk of earning this designation due to test participation. This would be impossible. Not only does the current ESEA waiver state that no new focus districts may be identified before the waiver expires at the end of the 2015-16 school year, test participation is not one of the criteria. LAP Schools were first identified in the 2012-13 school year and therefore, all LAP Schools have been identified for less than two years. Under the proposed ESEA Renewal Waiver, after three consecutive years of identification as a LAP School, the school will be identified as a Focus School, and must have a DTSDE review. The identification of the school may also result in the district becoming a Focus District. As you can see, it will take three years of less than 95% test participation for any of the schools in the district to be labeled a LAP school and it will take three more years of a school being labeled a LAP school to earn the designation of “Focus School” and at that point, the district may or may not be labeled a “Focus District.” This document is referring to a potential consequence that cannot occur for six years. This notion that after several years, the school will lose its “good standing” designation is clearly false. Student participation and assessment results impact teachers and principals. Every classroom teacher and principal receives a growth score from the results of the 3-8 assessments. A Growth Score is part of each teacher and principal’s annual professional performance evaluation. If a student does not take the test, it directly impacts and reduces the chance for that teacher and principal to receive a fair score towards their evaluation. Teachers do receive a growth score based on student results on state tests. However, it is absolutely crucial to understand that students who refuse the test do not receive a score of 0. As per the NYS 2015 SIRS Manual, page 62, “Students who refuse to take the entire test must be reported at the local level with a final score of “999” and a standard achieved code of 96, indicating refusal. These records do not move to Level 2 of the Student Information Repository System. These students will be considered to have “no valid test score” and will be counted as not tested. Students who indicate refusal to take the test but answer at least one question on the test will receive a scale score and performance level based on the questions answered.” In other words, this refusal neither counts towards, nor against, a teacher’s or principal’s evaluation. While it is true that teachers and principals receive a growth score based on student results from state test scores, it is also important to understand that a growth score is not an achievement score. This video from EngageNY explains how a student growth score is determined. Simply put, children across NYS are grouped into cohorts based on previous year(s) test scores, family socioeconomic status, a child’s English Language Learner status and whether or not they have a disability. Each student is then provided a Student Growth Percentile or SGP based on their scale score compared to the other students in their cohort on the current year’s test. (Please note, the SGP is not a measure of a student’s mastery of the standards or their proficiency on the exam, but simply a measure of relative performance of a student to a predetermined cohort of similar students. Likewise, because this measure is a percentile, the SGP is not a measure of current year’s performance compared with previous year’s performance). Student participation and assessment results impact schools and districts. When a student refuses to take a NYS assessment, the score is reported as an “invalid score” NOT as a “no score” for the test, which impacts a building Growth Score and accountability factors. Every “invalid score” counts against a school and district in regards to the “Student Participation Rate.” All schools and districts must maintain a Student Participation Rate of at least 95%. Under the current ESEA waiver, test participation is NOT one of the criteria used to identify Focus Districts and Priority Schools. New York State makes clear that in 2012, Focus Districts were identified as a result of their low performance and lack of progress in ELA and math combined or graduation rates for one of more accountability groups (racial/ethnic groups, low-income students, English language learners, and students with disabilities). Districts could also be identified as Focus if one or more Priority Schools were identified within the district. Again, once these schools were identified, no new Focus Districts or Priority Schools could be identified before the end of the 2015-16 school year. You can read more about that here. So at the moment, no school district that is considered to be in “good standing” will be put at risk of earning this designation due to test participation. This would be impossible. Not only does the current ESEA waiver state that no new focus districts may be identified before the waiver expires at the end of the 2015-16 school year, test participation is not one of the criteria. All Schools and districts must also achieve performance scores for each student subgroup (male, female, general education, special education, and ethnicity groups). When either the participation or performance rate is not met for two years in a row, a school or district is then put on a state accountability list. If the school or district does not get off of that list (by maintaining a minimum participation rate of 95% and meeting annual performance measures) the NYS Education department requires districts and schools to create plans and conduct initiatives that impact local control over schools. Again, if a school fails to meet adequate yearly progress (AYP) for the same reason for three years in a row, a plan would have to be written to address the reason why AYP was not met. If the reason for failing to meet AYP is lack of participation as a result of parents exercising their right to refuse tests, it leaves one to question how a school would address this. The “LAP Diagnostic Self-Review Document and Report Template” (available here) is completed when a school is designated as needing a LAP as a means to help the school improve. There is nothing on the form that relates to the 95% participation rate. As such, a school official would simply go through the form ranking everything ‘Highly Effective’ and this would have no impact on local control of the school. Despite rumors and movements that start to circulate this time of year, New York State does not have an approved “Opt Out” process for students who do not want to take the tests. In fact, all districts in NYS are legally required by the Federal Government to administer the 3-8 ELA and Math Assessments. Districts are not allowed to approve students to opt-out. Permission is not being asked and parents are refusing to participate in tests as opposed to opting out. Parents are allowed the right to refuse as per The Constitution of the United States, which provides that option (in no particular order of importance) on 14th Amendment substantive due process grounds (i.e., my right to nurture, raise, and direct the education of my child, my right and my child’s right to personal liberty, my right to protect my child from harm and for my child to be free from harm, and my right and my child’s right against unreasonable governmental intrusion), First Amendment privacy grounds, my child’s right against Fourth Amendment unreasonable governmental action, and Fifth Amendment rights. In addition, the Ninth Amendment recognizes that there are fundamental personal rights that are protected from abridgment by the government even though not specifically mentioned in the Constitution. Federal statutes also come into play. No Child Left Behind expressly provides: “Parents have the primary responsibility for the education of their children, and States . . . have the primary responsibility for the supporting that parental role.” 20 U.S.C. § 3401. Similarly, the federal government has declared that I must be afforded “substantial and meaningful opportunities to participate in the education of [my child].” 20 USC § 6301 (12). Indeed, the right to refuse to allow the state to compel a child to submit to a standardized test (or assessment) has constitutional dimensions that have been recognized by the Supreme Court of the United States for nearly 100 years. The constitutional right to guide one’s child’s education and to protect the child from harm and exploitation at the hands of government is one of the oldest fundamental liberty interests recognized by that Court. The Court has repeatedly held that because parents have the natural inclination to further the best interests of her/his child, it is the parent who is the best protector of the child and, therefore, the parent has the natural right and duty to care for the child and protect her against unreasonable, arbitrary, and capricious governmental action. It is the parent — not the school district — who is entrusted with this constitutionally-protected, fundamental right. The Court is emphatic that the State (the school district) has no right to interfere with or hinder a parent’s efforts to raise the child, or the parent’s efforts – the affirmative obligation — to protect the child from harm or exploitation. See e.g. 20 U.S.C. § 6311 (based on the specific requirements outlined in No Child Left Behind, high-stakes testing violates federal law). The Court has stated: “[t]he fundamental theory of liberty upon which all governments in this Union repose excludes any general power of the State to standardize its children [(my child)]…. The child is not the mere creature of the State; those who nurture him and direct his destiny have the right, coupled with the high duty, to recognize and prepare him for additional obligations.” Pierce v. Society of Sisters, 268 U.S. 510 (1925). My child is not “[t]he mere creature of the state.” As the Supreme Court has similarly held: “the custody, care and nurture of the child reside first in the parents, whose primary function and freedom include preparation for obligations the state can neither supply nor hinder.” Prince v. Commonwealth of Massachusetts, 321 U.S. 158 (1944). Parents have a constitutional liberty interest to direct the upbringing and education of the child. This right, guaranteed by the Constitution, may not be abridged by unreasonable policy. Even the New York Court of Appeals – the highest court of our state – recognizes this interest. The Court of Appeals stated: “It is the natural right, as well as the legal duty, of a parent to care for, control and protect his child from potential harm, whatever the source and absent a clear showing of misfeasance, abuse or neglect, courts should not interfere with that delicate responsibility.” Roe v. Doe, 29 NY2d 188 (NY 1971) (emphasis added). Neither should any branch of government. These constitutional, statutory, and common law guarantees do not disappear when a child enters the schoolhouse gate. In fact, the federal government has explicitly provided protection to the child within the school environment. See 20 U.S.C. § 1232h (protecting students from examinations without written parental consent). Therefore. please be advised that all students in grades 3-8 in attendance during the assessment as well as the make-up dates. will be actively engaged in taking an assessment in the same classroom assessment environment as their peers. Students will NOT be provided an alternative setting. location. or activity. If they are not taking the NYS 3-8 ELA and Math Assessment they will be taking a regionally created ELA and Math Assessment that will be just as rigorous as the NYS 3 – 8 Math and ELA assessments. Parents who exercise their right to refuse NYS grades 3-8 testing may also exercise the right to refuse a replacement test (see above). Providing students with an alternative exam suggests that the NYS grades 3-8 exams can simply be replaced by other tests. If this was in fact true, the District would have no problem with students and parents refusing to participate in the NYS exams and would offer a choice. Alas, a regional replacement test offered by the District is not the same as the NYS exams and cannot be used to contribute towards the 95% participation rate or counted towards student performance measures for accountability purposes. Similarly, the replacement test cannot be used for teacher accountability (APPR) purposes without the APPR being renegotiated (see here to review your school’s APPR). Since it has been established that the District already has multiple measures in place to assess student performance and academic programs, thereby making participation in a high stakes test, or alternative test unnecessary, the alternate tests are punitive in nature and meant to discourage parents & students from exercising their right to refuse. 1. What costs are associated with developing an alternate exam? 2. Who is writing the exam? Is the exam field tested? Standardized? Benchmarked? 3. When and how will the alternate exam be administered? 4. What are the consequences of offering an alternate exam in place of the NYS exams? 5. How will the alternate exam be scored, by whom, and at what expense to the District? 6. When & how will the results of the exam be communicated to students, parents & teachers? 7. What consequences are there to the student/how will exam results be used? 8. When and how will the alternate exam be made public? Note: As per the 2015 School Administrator’s Manual, no other materials may be present in the testing room and therefore, should the district choose to administer a regionally created assessment at the same time as the NYS assessments, it would violate testing protocol to administer an alternate exam in the same room as the NYS exam. It is also stated in the 2015 Educator Guides that, “s “No talking is permitted and no other schoolwork is permitted.” (see guides here) As such, students would have to take the test in another location. This leads one to question how the school will plan for, staff, and manage the various groups of students. Should the district choose to administer the alternate exam at another date and/or time in an effort to comply with NYS regulations as outlined in the School Administrator’s Manual, the exam becomes punitive in nature. Students who refuse the NYS exam that are requested to take an alternate exam at an alternate time will be denied their right to a free and appropriate education due to a circumstance created by the District’s unwillingness to recognize the right of parents. Read more about the right to a free and appropriate public education here. We hope this explanation helps you to make a well-informed decision with supporting your child through the NYS 3-8 Assessments. All in all, the letter from Ms. Belfield is nothing other than confusing. Parents trying to make a well-informed decision should be asking this: If the “…results from state assessments are an integral part of instruction.” as Ms. Belfield notes in her letter, and, “…all districts in NYS are legally required by the Federal Government to administer the 3-8 ELA and Math Assessments, “ how can the school provide an alternative to those tests? It is clear that the intent of this letter is to coerce parents into participating in state exams. Parents: remain steadfast in your intention to refuse high stakes tests. 3-21 GO! will be held at the Thomas R. Proctor High School auditorium. Follow optoutcny.wordpress.com for updates on this important event as communities across central New York come together to show support for public schools, teachers, and most importantly, the children they serve. 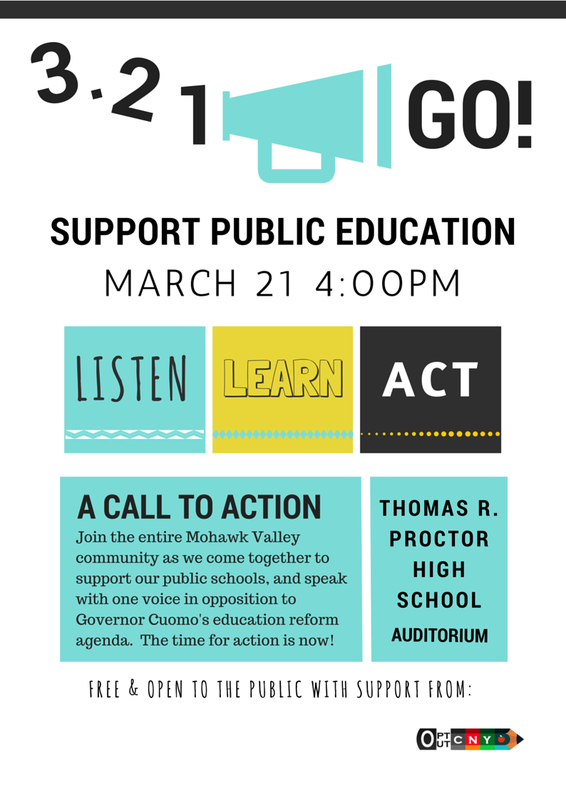 Don’t miss the next big event of the Mohawk Valley as students, parents, teachers, school administrators and Board of Education members come together in opposition to Governor Cuomo’s “Opportunity Agenda”. See you there! My name is Trinh Truong and I am writing to share the sad but true story about the status of my public education. I’m a senior at Thomas R. Proctor High School in Utica, New York. My school is in a very urban area with a wide range of cultural and socioeconomic diversity. There are 2,800 students that attend my high school. There are over forty-two languages spoken at my school and forty-four percent of the students live at or below the poverty line. My high school is representative of the community in which I reside; there are 60,000 residents in Utica, with about 25% of them being refugees. The poverty rate in my city is very high, so on top of having the double-edged sword of diversity we also have a weak tax base. The population of our school district has increased by 900 students within the past decade. However, state funding has decreased, and continues to do so. We are in a unique situation—pervasive poverty, increasing enrollment, a weak tax base, and the emergence of charter schools. I cannot stress enough the importance that state aid plays in sustaining and fostering my local school district. Every student in New York State has the right to a “sound, basic education” as per the New York State constitution. The state has an obligation—moral and constitutional—to step up and eliminate the disparities and deficits in education funding. Utica has done the best that it can to provide a world-class education to its students on dwindling resources, but will not be able to do so if these education cuts persist. These education cuts have already cost my local school district enough, and yes—money does matter when it comes to education. There are over 34 students in a typical class in my high school. Sometimes, students have to stand because there aren’t desks for them to sit in. The same thing is occurring at the elementary level. Elementary teachers have even changed the seating every week so that each student has a chance to see the board. The issue of class size is just going to be exacerbated by the imminent teacher cuts. Regarding supplies—my chemistry class, along with the physics and biology classes, has had to sell coupon books in order to pay for our science experiments. How is one supposed to learn chemistry without chemicals? I’m still trying to figure that one out. In my English class, paperbacks are photocopied because we simply don’t have the money to order more. And some classes don’t even have textbooks because again, there is no money for them. This is inexcusable. But what’s truly inexcusable is that this issue of educational inequity isn’t limited to schools like Proctor or districts like Utica—it’s a crisis that many schools in New York State are facing. Governor Cuomo swears all of this reform isn’t personal—but it is. My mother and I resettled here, in Utica, because of the opportunities that education can offer. It’s truly a socioeconomic equalizer in this country. The teachers and administrators of the Utica City School District do their best to bring everyone to their full potential, regardless of race, religion, class, and the many other categories in which the diverse students of Utica can be grouped in. And they’ve done it for me. Sometimes people think that’s a feel-good sound byte that I include to make my district stand out, but I really mean it. In my personal experience, the value of the Utica City School District cannot be quantified. I literally came to this country with absolutely nothing, and public education has given me everything. The education I received has set me up to attend the top universities in this nation. Statistically, I wasn’t supposed to succeed. But because of a school district like Utica—I did. When the Governor is enacting policy that will directly affect my future and the futures of the 3 million students in this state, you bet it’s personal. Governor Cuomo, I’ve been advocating for public education since my freshman year. I’m now a senior. After fighting tooth and nail for the simple idea of adequate funding for education, I’m angry. I’m angry that the Gap Elimination Adjustment and frozen foundation aid continue to deprive districts in my community of funds needed for teaching the next generation. And now I’m even angrier that you’re on a witch-hunt to fire some of the most respectable people in this country—teachers. It’s amazing that 98.7% of teachers manage to be effective, especially when teachers like the ones in Utica are shaping students that struggle with broken families, poverty, language barriers, and special needs. I don’t think that making 50% of a teacher’s worth dependent on standardized test scores will weed out “ineffective” teachers. In reality, it will decrease interest in the field of teaching, discourage amazing educators, and perpetuate de facto segregation in public education.